A little bit belated but Happy New Year! I’ve been sorting out the bears after the Christmas events making sure they are all still perfect and happy. Of course I have had a frenzy of making new bears ready for the new season, it’s a wonderful excuse to do so when lots are sold! I can go rummaging around my stock of materials and see what catches my eye to make the perfect bear – and they are all perfect to me as I finish each of course. Looking back on my creations now, I notice that I seem to have gone through a bit of a ‘pink’ period! I wonder what that implies. Several of the new bears have a pink flavour to their furs. 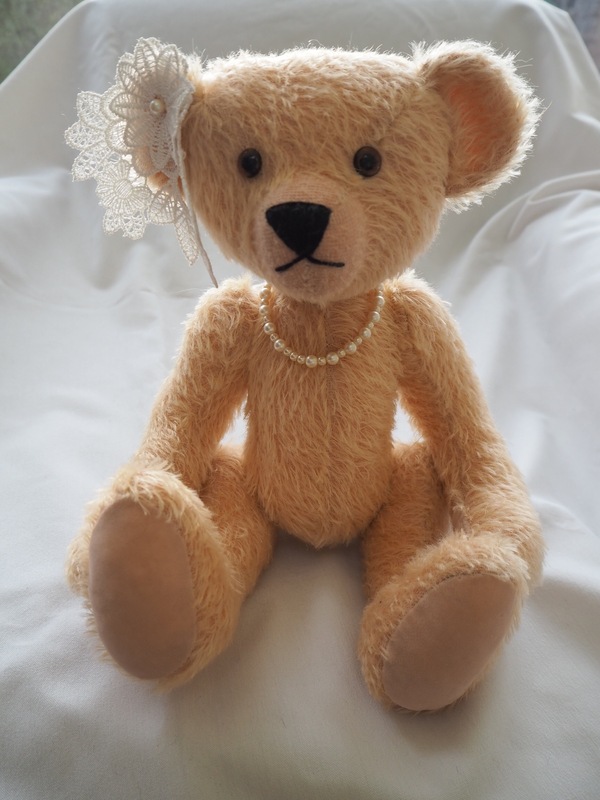 Just released into the world is my beautiful Fleurie, who is actually made from the same fabric as Blossom our ‘hallmark’ bear on all the letterheads, table covers and promotional materials. The colour of this dye lot of material is very slightly peachier than Blossom, but so beautiful. I made her because I have been asked so often to sell Blossom and I cannot bring myself to do so. So Fleurie is very similar but still different. We also have Evelyn, Isabel, Sophie and Florence all in pinks. Isabel is made from a cream mohair that I hand dyed myself with a random very soft pink and with its lovely whispy 15mm hairs she gives the impression of a delicate little thing but is actually quite nicely firmly stuffed. In the making (as my grandmother would say) we have another 28cm pink bear called Alice. She is from a gorgeous baby pink dense 9mm Steiff Schulte Alpaca and so will be a most cuddlesome bear! Quite a few pinks as I said. But thrown into the mix we have Humble and Dawn. Humble’s hand dyed mohair is not quite pink, I must have been edging away from it then. Dawn is of Schulte Bluebell 9mm mohair and makes a lovely bear away from the traditional colours. I still have more bears growing, Harry and Archie are both 15cm tall. Harry is made from a natural laid antique gold on brown mohair and Archie is a great rust and flame tipped mohair bear. The bears ‘in the making’ will be ready for our next outing which will be at Hugglets in Kensington town Hall in London on Sunday 24thFebruary and I very much look forward to meeting you there! See you at Hugglets on the 24th February!